But when you pick it up the floor falls back down. Now this doesn't bother really bother me that much but I thought you should know. When you flip up the floor there's a sticker, there is also one on the inside of the back wall as well. Next we have the piano and piano bench! Mini Josefina: A piano! I love playing the piano! The piano bench is good thick plastic. It comes to just below the knee and fits one mini doll. The piano comes to Mini Josefina's shoulders and has little foot peddles at the bottom, sadly they don't move. Then it has molded on keys. I really like the size of the piano and how it looks with a mini doll playing it. Here we have the radio! Sadly the American Girl Minis can't hold this without some handy dandy help from their humans, but I think the My Life As Minis can. It's a light purple color and the handle that goes up and down. I think it looks a little big but the stereo at my dance school is pretty big so maybe that's why. Now moving on to the ballet outfit and dance bag! The dance bag is just a simple bag with two handles, the corners are painted purple and the ballet outfit fits inside. The leotard is pretty nice, it's made out of a stretchy fabric and fits the doll nicely. It is also attached to the leotard. It Velcro's in the back. There are a pair leg warmers (I don't why but for some reason one leg warmer look a lot shorter than the other, but they really aren't that different in size) and a pair of ballet slippers. The slippers are really big on AG minis though, I would think they'd fit MLA minis. and has a hook and hanger. The cute tiny little hanger comes off the hook, but the leotard doesn't stay on the hanger. But Mini Molly's sweater does! And I think other mini clothes will fit too. Or you can hang the dance bag on the hook! And last but not least, the ballet bar!!! Ok, the bar slides a little on the floor but I love it for posing my mini dolls! Mini Molly: Oh yeah! Katie only wishes she could do this! 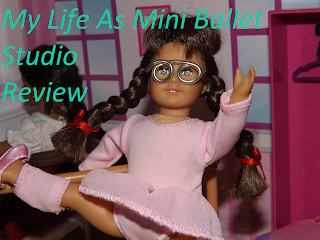 Mini Molly: You've got to do lots of ankle strengthening exercises when you're a pointe dancer. Mini Molly: Woo Hoo! Nailed it! LOL this picture was inspired by a little boy at my dance school. We were getting ready to start dance class, so my ballet teacher was going to close the sliding glass door of our classroom when a little boy, who I think was about two, came over. "What are you going to do with that?" The little boy asked, pointing to the ballet barre in the center of the room. "That's a ballet barre," my teacher explained. "Oh, are you going to jump over it?" He asked. "Nope, why don't you watch and see?" He said to the little boy before closing the door. Three to five minis fit at the barre nicely, depending on what position they are in. Overall, I really love this set and I would totally recommend it to you guys :) Thanks for reading guys! I really hope you enjoyed the post, come back soon for the intro to the new dolls that joined the family this holiday and birthday season! Who do you think it is? (Don't tell them Jewel! XD) Let me know in the comments! Hello, I am Mini Molly, one of the newest minis in the ADU family! And you won't believe this but I risk my life for this blog, for I have been attacked by huge, hairy beasts! "Oh no! There's one right there!! "Oh no! Do not eat me! Please!" "Ahhhhhh! It's trying to squish me like a bug! HELP!!" "No! I shall never let you hurt my friend! I shall conquer you! You uncivilized beast!" Katie: Mini Molly stop it! That is a cat, not a uncivilized beast!" Wow! This looks like such a cool set! Ha ha! Mini Molly is just like big Molly! Thanks! I really like it. LOL she is! XD I wasn't even planning that story at the end, but my crazy cats decided to come and knock everything over, then Gloria (The white one) just laid down right in the middle of the set and I was like "Oh wait!" XD Thanks for commenting! The cats are adorable! I'd like to unleash Nibbles (My guinea pig) onto one of my sets! I think that would produce some interesting results. The ballet studio is adorable. It's cool to see mini doll things because of their size. Thank you! I love them very much :) Awww! That would be cute! LOL yeah, letting your pets run around your sets usually gets a little strange... Thanks! Yeah they sell lots of mini stuff at Walmart that's really cool, I was super excited because it's hard to find things for the minis. Love it! I love that Mini Molly has a neck-string! I have Julie and Kit, but they are both the plastic bodies. Unfortunately they scratch easily. Thanks! Me too, they are actually made the same as the 18" ones! Oh cool you got a mini Julie? Yeah, I'm kinda sad they changed to plastic bodies, oh really? I didn't know that. Thank you! Hahahahahahaha! That story about that little boy at your dance studio made me laugh so hard!